"Black beans and rice are the logical accompaniment to this hearty pork roast. A salad of orange slices, red onion and arugula dressed with a tangy cilantro vinaigrette would be refreshing. If there are any leftovers, make media noches, the Cuban sandwiches that are made with Swiss cheese, ham and toasted egg bread in addition to roast pork." Heat a small, heavy skillet over medium heat. Add the cumin seeds and peppercorns to the pan; stir constantly until fragrant and beginning to brown, about 2 minutes. Cool. Using a mortar and pestle, crush toasted spices with garlic, salt, and oregano to make a paste. You can also do this in the small bowl of a food processor. Transfer to a small bowl, and stir in orange juice, lime juice, lemon juice, sherry, and olive oil. Place the pork in a large resealable plastic bag. Pour citrus marinade over meat, and seal. Refrigerate for 12 to 24 hours, turning the bag over occasionally. Transfer pork and marinade to a roasting pan, and place in the oven. Roast for about 2 1/2 hours, basting with pan juices occasionally, or until an instant read thermometer inserted in the center reads 145 degrees F (63 degrees C). Add small amounts of water to the pan if it dries out. Transfer the pork to a carving board, cover loosely with foil, and let rest for 15 minutes. Carve, and serve. Watch Chef John mess up a pork roast, and learn how to do it right! 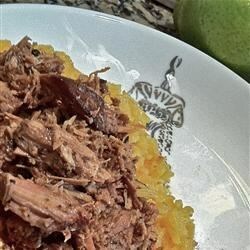 Very traditional Cuban pork. I reduce the sherry and add 1/4 c white vinegar. I also slice a large onion and add that to the marinade. Works well roasted in the oven or in a crock pot. Excellent! Cooked it in the crock pot and we loved it! My family loved this recipe. We often eat at a Cuban restaurant near our home and this was as tasty and tender as the restaurants. Will make it again.